In 1996, the American conjoined twins Abigail and Brittany Hensel went on the Oprah Show and spoke about their daily lives and their wish to impress upon the viewers how they both were quite ordinary people. Documentaries followed and they got their own reality show at TLC. In the show, the audience could follow their everyday life; at home, in school, and when doing extracurricular activities such as taking their respective driver’s licences. The viewers were also allowed to access the twins’ hopes, dreams, and plans for the future. Abigail and Brittany portrayed themselves as having two quite different personalities and expectations on life, and went on air to counter preconceptions about conjoined twins. By showing the public how normal they actually were, they wanted to demystify the condition. They were two young girls who wanted to raise awareness and be treated as the regular persons they were. The Youtube clip below shows one of the first documentaries about the twins. The strongest message is that Abigail and Brittany indeed are just the same ‘as everyone else’, a few physicians flash by. Even though they themselves stress that they respect the wishes of the twins and their family to not conduct more advanced medical investigations than regular check-ups, the strong curiosity still shines through. YouTube video titled "Abigail & Brittany Hensel - The Twins Who Share a Body"
Conjoined twins have been a topic of interest in medicine for many centuries. Physicians have for example debated whether these bodies were the vessels of one or two souls, as well as pondered why and when this condition happens during pregnancy. In my research, I examine the social processes of collecting bodies for medical science in nineteenth-century Sweden. More specifically, I am interested in why and how the bodies of embryos and fetuses, of which many were conjoined twins, were obtained, transformed into scientific objects, and put on a shelf in a medical collection. An aspect of this is the social construction of ‘normality’ and ‘pathology’, as well as who set the boundaries. How were conjoined twins understood in the Swedish society at the time? To contrast definitions set by the medical community, media representations is a way to start unpacking notions about how people with this kind of body were regarded by society and how they understood themselves. This is important when attempting an analysis of the dynamics of collecting practices. Throughout the second half of the 19th century, there were short reports in the Stockholm-based daily newspaper Dagens Nyheter of ‘siamese twins’ born in other parts of the country and several adverts about touring so called ‘freak shows’, especially international ones. Among these were short reports about Chang and Eng Bunker, the original ‘siamese twins’. They were born 1811 in Siam, today’s Thailand, and after years of touring the world as a sideshow attraction, they settled in the USA. The Bunkers became famous both at home and on the European continent. They both married, had children and became homeowners and farmers, spending alternating nights in their respective homes. 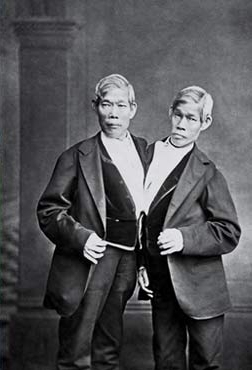 Chang and Eng themselves cultivated their individuality, marking their difference through property and social relations. They travelled the world and performed in front of an audience, putting themselves on display as a mean to earn an income. This was their way of making a living, by directing the audience’s gaze towards their extraordinary bodies. Yet their private lives were aligned with expectations on contemporary well-off middle-aged men. The fact that each had a family and a household to provide, leading such ordinary lives became part of the narrative of wonder. A black-and-white studio portrait of Chang and Eng Bunker, two middle-aged men with stern faces, joined at the abdomen, wearing suits. This raises questions about the construction and borders of normality, what does it mean to have a normal life? In the cases of the Bunker- and Hensel twins, normality is imagined as a way to participate in society and thus performed accordingly. Attention is centred at, yet drawn away from the shape of their bodies and instead directed onto what kind of activities they can do and which kinds of lives they can lead. In my research, I encounter only fragments of information about Swedish conjoined twins outside the medical sphere, most often filtered through the accounts of medical practitioners. Since my point of departure is anatomical collections as a mean to trace practices and attitudes, it is specimen jars on display in museums and used for research which dominates my field of view. They are produced in the context of medicine and mediates a specific narrative of what normal and deviant bodies are. I aim to look beyond these images and to include the agency of positions outside medicine in order to gain a more nuanced analysis. One of the problems I face in trying to understand the shaping and negotiation of normality in my period and place of time is that it is very difficult to locate sources containing the voices of conjoined twins themselves, or the ones of their families. The easiest voices to find are the ones of scientists and medical practitioners, and I am worried that I will slip into the trap of reproducing only the narrative presented by them. Thus, framing the collected bodies as raw material for research and reproduce exoticism, as well as cement ideas about what constitutes ‘a normal body’. 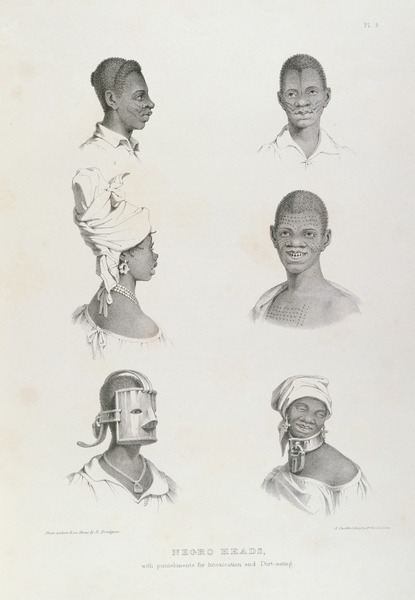 This struggle resonates with the one faced by Rana Hogarth, who in a previous blog post wrote about the issues of researching the history of slavery and how to tackle the asymmetry of records. What did it mean to give birth to conjoined twins, what were the consequences if they died, or survived, and which were the implications for the negotiation between the parents of deceased conjoined twins and the medical practitioners who wanted to collected the bodies for scientific purposes? These are questions I am hoping to be able to address and I consider disability research to be a powerful tool to steer the gaze away from the stories told by medical men, who had their own specific agendas, and instead ask what the lived experiences of conjoined twins themselves and those of their families were. Since there is a scarcity of records of this, one way around is to look at how conjoined twins were portrayed in the media at the time (the Bunker-twins being the most famous example), as a way to raise new research questions which might direct me to source materials I’ve previously not thought of and a mean to reconfigure the framework. Another way is to aim for self-reflexivity and challenge my own subconscious preconceptions by watching stories told by conjoined twins in my own time, such as the Hensel-twins. There is a lot of power of in the choice of perspective and thus it is vital to shift back and forth between more than one during the research process, as well as being transparent in what kinds of choices we as historians make when writing history. Helena Franzén is a PhD student within the project Medicine at the borders of life: Foetal research and the emergence of Ethical Controversy in Sweden, funded by the Swedish Research Council Dnr 446– 2014–1749. See http://medicalborders.se. Helena Franzén (2018): “Just like everyone else”: Studying constructions of ‘normality’ through attitudes towards conjoined twins. In: Public Disability History 3 (2018) 11.